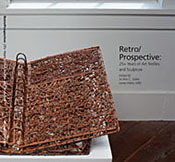 Bikuben Paper Museum, Silkeborg, Denmark; The City Musuem, Deggendorf, Germany (Globalpaperartll); Charmey Museum, Switzerland (6th Triennial of Paper); lnternational Paper Salon, Ghent, Belgium; Art Gallery, Dominican Church, Osnabruck, Germany; Museum Rijswijk, Den Haag and CODA Museum, Apeldoorn, the Netherlands (Holland Paper Biennial); Kloster/Schloss Bentlage, Rheine, Germany (Hans Jürgen Simon Paperworks, Ernst Gamperl Woodwork); Cultuurecentrum de Torhout, Belgium; Salzwedel, Germany (HANSEartWORKS); Neuer Kunstverein Aschaffenburg (Art paper = 6); Galerie Hilde Leiss, Hamburg, Germany; Frankfurt Book Fair, Germany; Galerie 59, Amsterdam, the Netherlands (New Print Media Work; traveling exhibition). Recipient: Third Place Award, 6th Triennial of Paper. 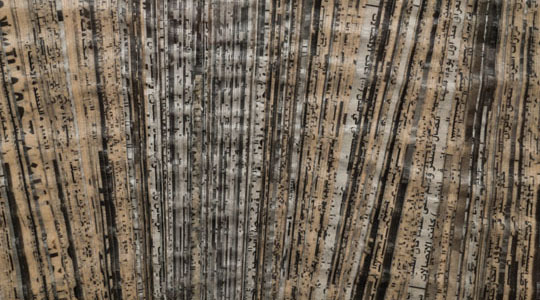 Working with Print Media is how Hans Jürgen Simon characterizes his work and simultaneously describes the material out of which he fashions his art. 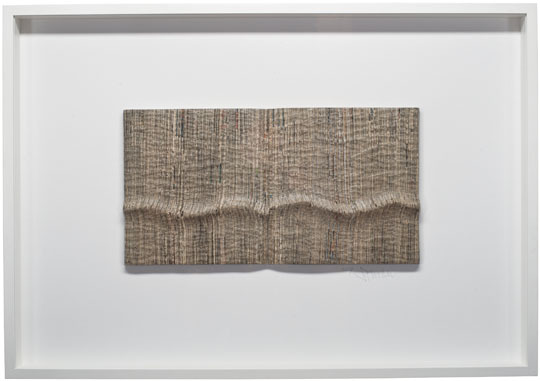 Simon, one of the artists in Paperworks: material as medium, which opens at the Flinn Gallery in the Greenwich Library in Greenwich on May10th, creates works from printed pages, some of which have not found their way to a reader. 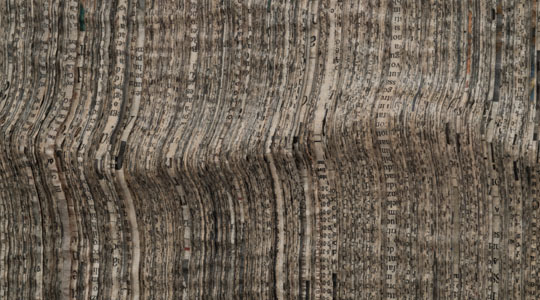 He dissects newspapers and returned books and magazine pages and finds new relationships, new materials and colortones, concentrating on the quality of the paper, the color and the typography of the media. 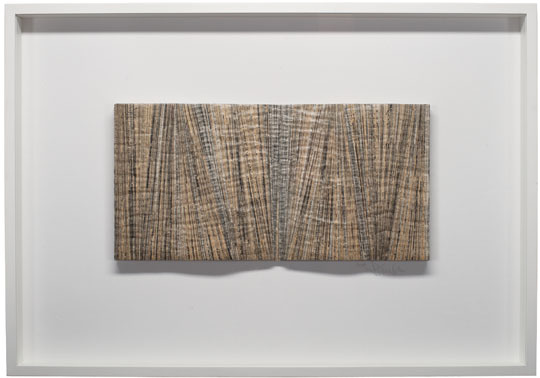 The result: works that resemble landscapes and topographical forms in which the raw material has been encrypted, leaving for the viewer, according to one critic, "a camouflouaged trail" of letters and image fragments that reveals "a new structure of meaning." In his studio in Georgsmarienhütte, Germany, Simon has been composing his imaginatively original and pure forms since 1991 and presenting them in public nationally and internationally since 1994.